Writing my post on Wednesday about the Royal Alcázar Palace in Seville brought back such beautiful memories I just had to post some more pictures. We had such an extraordinary day here. You can see the Giralda Tower of the Cathedral of Seville from the Alcázar courtyard. I really just can't get enough of this palace. The second to last picture really just captures the beauty of the light in the place. I have GOT to get to Spain! More beautiful photos! Your pics from your summer trip are really making me want to plan a trip to Spain! Such beautiful photos, Sonja. My palace ones are wet with grey skies! Absolutely beautiful pictures and architecture! 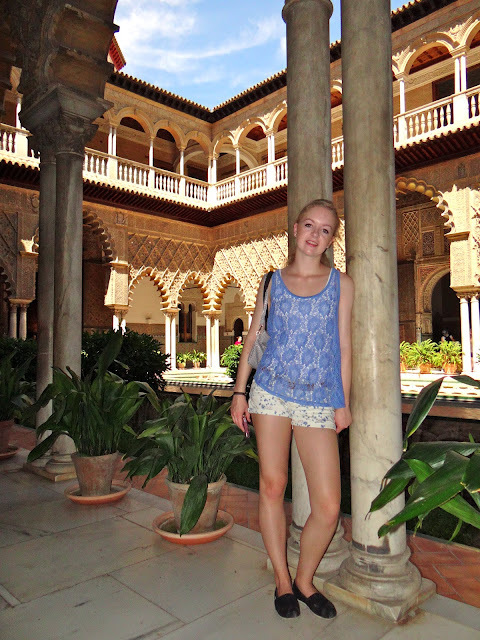 The Alcazar is gorgeous and you're making me want to plan another Spain trip. Seville seems such a contrast to Madrid. I love all the tile work from your last post.